Ricky Wong: Is there Still Justice? After being rejected for the free-to-air TV license, Ricky Wong Wai-kay, Chairman of HKTV, met with the media yesterday (16th October) afternoon. During the press conference, Wong conceded that it was the government that invited him to apply for the license, and he also criticised the black box operation of the application review and approval process. He questioned if “there is still justice in Hong Kong”. Wong asked the government to publish the evaluation standards of the license issuance. However, the Hong Kong SAR Government may not dare to publish the “score cards” of the evaluation. Based on the consultancy report submitted to the government obtained by Apple Daily, HKTV ranks number two in the evaluation, and PCCW’s Hong Kong Television Entertainment came last in the evaluation. Three chiefs of the government also agreed that licenses should be granted to all three applicants, including HKTV. However, CY Leung and the Executive Council (ExCo) against all the advise and rejected HKTV’s application. This causes the public to question whether the decision was made based on political reasons. Ricky Wong said in the press conference that HKTV is the applicant of all three that offered the best conditions but was denied a license, and criticised the government’s decision, “if this ends here, justice is lost in Hong Kong. Is there still justice in Hong Kong?” He thinks that the government’s decision is completely against the public’s will. He also said that in end of 2009, “(someone from) the government called me” to invite him to apply for a free-to-air TV license. He had always believed in the government, and he is shocked and disappointed that HKTV is not granted a license at the end. He also criticised the government for “changing the rules without consensus”: from “no limit in number of licenses” to “picking two of three applicants”. He described the result as unreasonable and unfair, and condemned the evaluation process as a “black box operation”. Wong also announced at the press conference that HKTV will immediately lay off 320 members of staff. 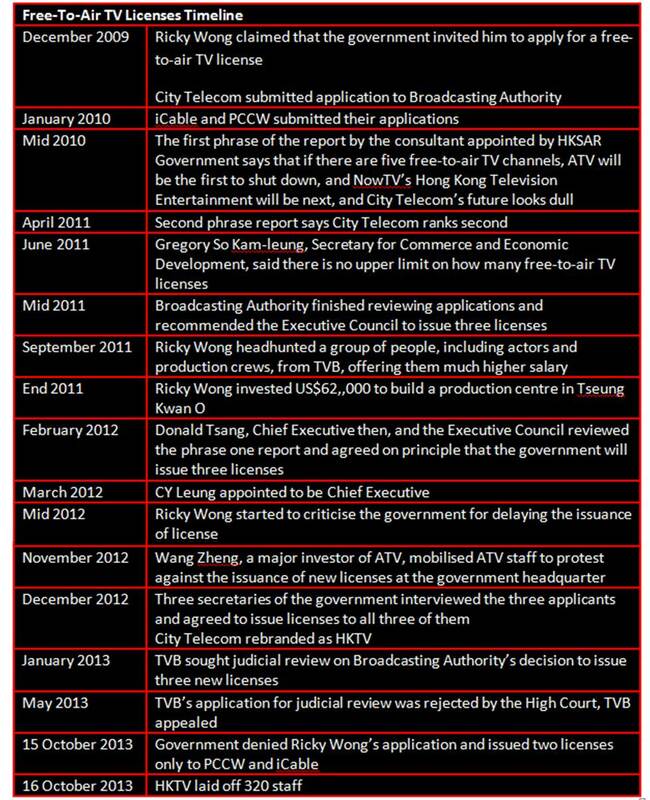 In fact, HKTV was not last on the score cards. Broadcasting Authority appointed consultants to review license application process twice: in 2010 the first phrase of the report was completed and the second phrase report completed in 2011 is obtained by Apple Daily. According to the not-yet-disclosed phrase II report, iCable’s Fantastic TV has the highest level of competitiveness and it can survive no matter how many licenses are issued, just like TVB. HKTV’s competitiveness ranks second, because its cost structure is relatively low and more flexible, when the average viewing ratio of HKTV channels goes up from 0.15% to 0.26% it can break-even. PCCW’s Hong Kong Television Entertainment came last on the evaluation. The report says that it needs to improve the efficiency of its programmes massively before it can break-even, with a lower coverage of its service, it is least likely to survive among all three applicants. It’s advantage, however, is the strong financial back-up provided by its parent company, PCCW. The phrase I report says that by issuing more free-to-air licenses, ATV will be forced to shut down. However, in phrase II report this has been revised, and says that “other factors” besides ATV’s operation capability in Hong Kong could determine the survival of ATV. The report then says that even if there are four free-to-air TV channels, ATV can still survive, but expect its operation level to remain the same, which means no profit can be made. The report also says that Hong Kong can only have four free-to-air TV channels, but does not mention whether ATV can survive if there are five channels available in the market. Source from the government said that after reviewing the reports, Broadcasting Authority (renamed as Communications Authority in 2012) thinks that the government has no responsibility to ensure ATV’s survival and all broadcasters have to adjust their strategies base on the market condition. Besides, the report also says that free-to-air TV channels’ total advertising revenue is higher than the five companies’ total operation cost, hence recommend to issue news licenses to three applicants. Since ATV’s public protest against the license issuance and TVB’s judicial review application last year, sources said that Chief Secretary Carrie Lam Cheng Yuet-ngor, Financial Secretary John Tsang Chun-wah and Secretary for Justice Rimsky Yuen Kwok-keung were appointed to look into the issue. The three secretaries interviewed the representatives from all three applicants and agreed that all three should be granted a license. Even pro-establishment lawmakers were surprised about HKTV, ranks second in the reports, is denied for a license. In private, they said that “it is impossible for not having political consideration when this decision was made”. Sources also suggest that Rita Lau Ng Wai-lan, former Secretary for Commerce and Economic Development, invited Ricky Wong to apply for the license. However, the department said yesterday that there is no record showing that the government invited anyone to apply for TV license.